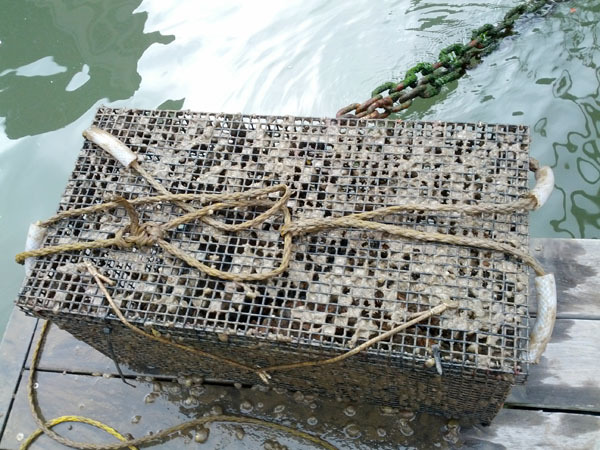 Last month, I stopped by the oyster garden to find a handful of sea squirts hanging from the rope and top of the cage. They didn’t seem like a nuisance at the time, so I left them. Much to my shock and dismay, this month I tugged the rope to find the the ropes and cage were entirely encrusted with sea squirts. Muddy, bulbous, gnarly–the cage had gone from pristine to biofouled in under two months. I had been able to lift the cage easily on my own, but with the additional sea squirts, the cage was too heavy for me to pull out of the water. I flagged down someone for help, then scraped off as many sea squirts as possible. The sea squirts did not go without a fight, and jetted streams of brackish water at me. With plops and squelches, I managed to pull most of them off. Here’s the cage after I tried my best to clean off the exterior. There’s still quite a few sea squirts in between the holes and inside the cage, but I didn’t have a utility knife on hand to open the cage. It turns out that sea squirts are an invasive species, most likely brought to North America on the hulls of ships or introduced by ballast water. They are common off the East Coast and in the Pacific Northwest, and present a big challenge to aquaculture operations. It seems like there’s no good way to prevent their growth without damaging other marine creatures, so you simply have to physically remove them. 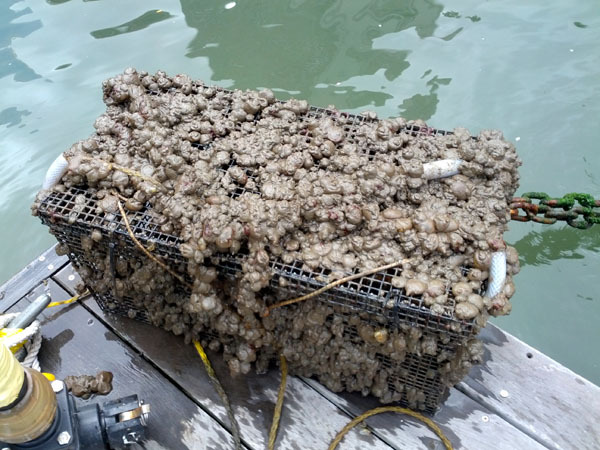 Otherwise, the thick mat of sea squirts will prevent water flow to the oysters, starving them of nutrients.